Hale'iwa, Hawaii is a North Shore community on the island of O'ahu. Hale'iwa is the largest commercial center on the North Shore of the Island. 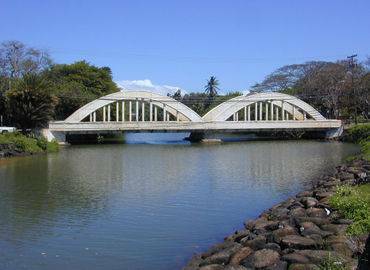 Located on the Waialua Bay, Hale'iwa Beach Park surrounds the north side, Hale'iwa Ali'i Beach Park surrounds the south side and a small boat harbor is located here, with Kaiaka State Recreation Area located to the west. Founded by missionaries Rev. and Mrs. John Emerson in 1832, the town is now a popular destination for surfing and diving enthusiasts. As of the 2000 census, the population of Hale'iwa was 2,225. The Pu'u O Mahuka Heiau, the "Hill of Escape", is the largest temple on O'ahu, covering over five acres. One of only two places where wives of chiefs went to give birth, this was a powerful place for a kahuna. It is believed that this may also have been a place where human sacrifices were performed. Pu'u O Mahuka Heiau overlooks Waimea Bay and is a registered state historical site, as well as a national landmark. Nothing should be moved or removed from this site, as it is considered sacred to the Hawaiian people. 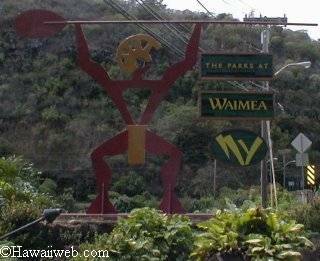 The 1800 acre Waimea Adventure Park sits in the beautiful Waimea Valley. The park shows the kahiko (ancient) Hawaiian lifestyle through cliff diving, craft demos, language lessons and hula dancing. You can also take a walking tour through the botannical gardens and ancient ruins to enjoy their exotic flower collection which is included in the park's admission price. You will also be witness to the breathtaking beauty of Waimea Falls, where professional cliff-divers perform spectacular dives from 45-60 feet in the air. There are four theme areas to the park: adventure, nature, adventure, children's play area and Hawaiian culture. For an additional fee (add-on), you can go mountain biking, ride ATVs, horseback riding or even kayaking. Park hours are 10am-5:30pm every day. Adult admission is $24 and $12 for 4-12 year olds. For $2 a person, you can enjoy a guided tour of the park via tram.